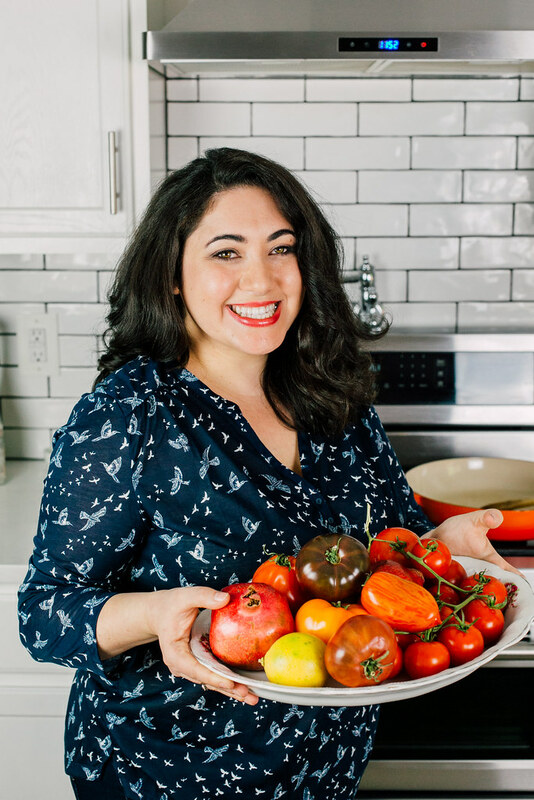 I have been on a massive, big salad kick lately (Hello, Greek Fattoush Salad! )and now that it is finally above 60 degrees here in Washington, all I want are big cold salads and anything on the grill. 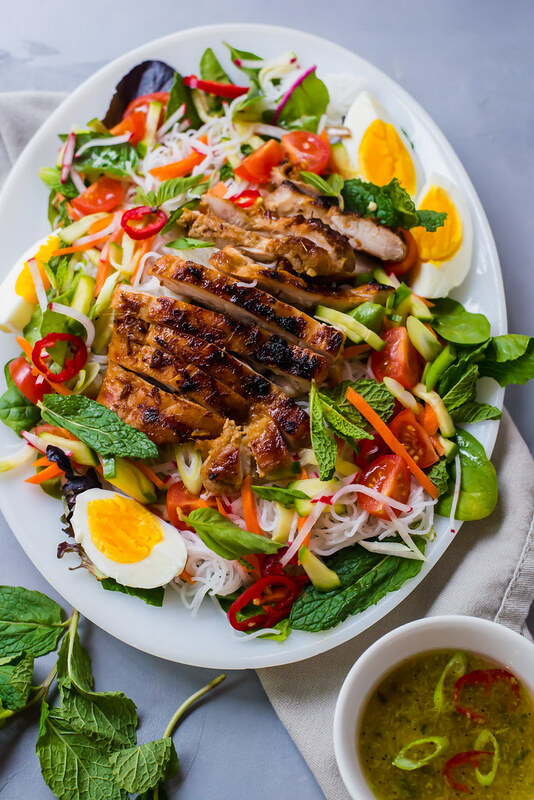 I’m happily caving into to my most recent summer addiction, including this massive rice noodle salad with Vietnamese grilled lemongrass chicken. Salads are what summer is made for. I was certainly spoiled when I lived in California and Hawaii, but over the last year I’ve become accustomed to the cooler months in the Pacific Northwest and 60 degrees practically feels like summer now. We’ve been making it a point to go outside and grill pizza as often as possible! and I even planted plants all around the house and started my first vegetable garden! Do you follow me on Instagram? I am always sharing behind the scenes. So far I have 4 tomato plants (because you know I’ll be making bowls of silky smooth gazpacho with them), 2 chiles, kale, rainbow chard and lettuce. I can’t wait to see how they turn out throughout the summer! Now let’s chat about this rice noodle salad, shall we? Also called “bun chay”, this is a modest inspiration from our favorite Vietnamese spot here in little Bellingham. Pho 99 it’s called and during the rainy months, we happily drag ourselves for a huge bowl of hot pho. But in the summer, we are addicted to their noodle bowls. So addicted, that I was insistent on recreating those infamous Vietnamese noodle bowls at home. And, I’ll have to say, it honestly hit the spot. This rice noodle bowl is layered with incredible flavors of sweet and spicy pickled vegetables, which are quite easy to make, might I add. And my favorite part, the slightly sweet and salty Vietnamese grilled lemongrass chicken! The chickens marinade is loaded with fresh lemongrass, ginger and soy sauce and has all of the sweet, salty, umami flavors complimenting each other so perfectly. 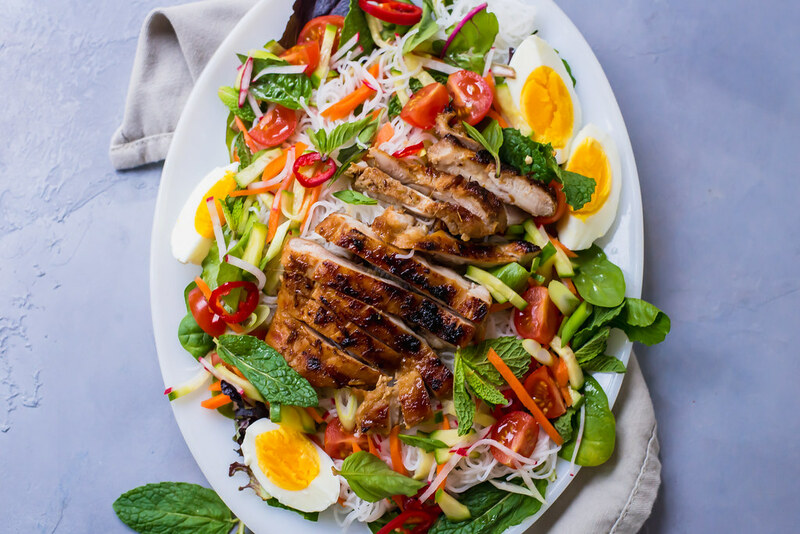 Layer the sliced Vietnamese grilled chicken over a bed of spring salad greens, rice noodles, fresh tomatoes and for added richness, a perfectly boiled egg. This rice noodle salad is not only beautiful to look at, but is protein packed as well and I can’t tell you how many times I’ve eaten it this month alone. 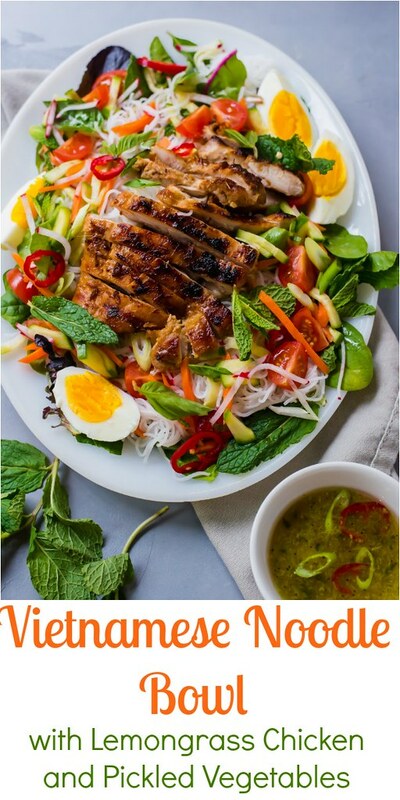 This rice noodle salad with Vietnamese grilled lemongrass chicken will be your new favorite summer dinner. And may I suggest, skewering the chicken and serving in lettuce cups with sriracha for a fun hands on dish. And just in case you have an extra package of rice noodles laying around, these Cold Asian Noodles sound so incredibly refreshing and perfect for summer! Asian pork meatballs over sesame rice noodles sounds so delicious and perfect for a mid-week dinner as well. Your new favorite summer dinner, Rice noodle salad with Vietnamese grilled lemongrass chicken and sweet and spicy pickled vegetables and fresh herbs. First make the vinaigrette by whisking all the ingredients in a bowl or shaking in a mason jar. Taste for seasoning and set aside. 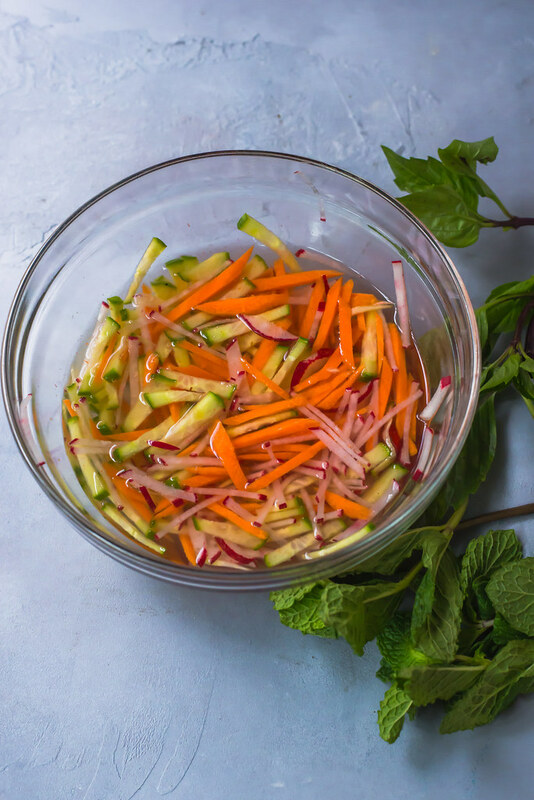 Make the pickled vegetables by whisking together the rice vinegar, sugar, water and salt and add vegetables to mixture. Toss to coat and set aside. For the lemongrass chicken, add chopped lemongrass, garlic, ginger, soy sauce, fish sauce, brown sugar, sriracha and oil to a small food processor and blend until smooth. There may be a few larger pieces but that's OK as it all cooks off. Add the marinade to the chicken thighs and toss to coat. While chicken is marinating, preheat indoor or outdoor grill on high heat and cook chicken for about 4-5 minutes per side and until you have good grill marks. 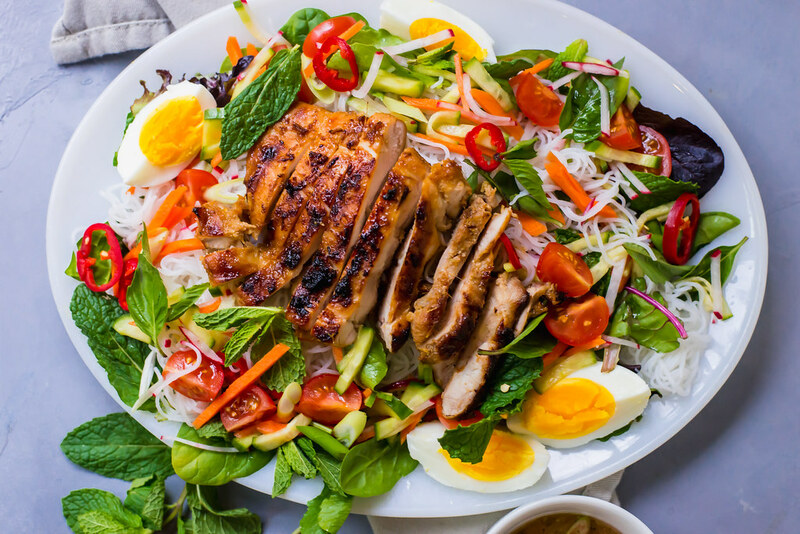 Slice chicken into 1/2 inch slices and arrange on a platter with salad greens, cooked rice noodles, pickled vegetables, tomatoes, boiled egg and fresh herbs and drizzle vinaigrette all over. I live in Bellingham, and congratulate you on your garden! Make sure you sow successive plantings of the lettuce and chard to keep yourself in greens throughout the summer! About every three weeks will do it. And when you harvest, use the French “cut and come again” method to extend the life of the plant. I will try this recipe for sure! Hi and thank you for the wonderful tips! I will have to look up “French cut”. I used starts so I may have to buy new starts or seeds if that’s correct? Have a great weekend! Hello, glad you have a garden 🙂 I have a it on my balcony looking to the south and am quite proud to have it myself. Thank you for this vibrant week dinner suggestion. Will be back ! I made this for dinner last night and it was delicious! I subbed out sweet turnips for the radishes that I got at the farmers market. I also marinaded the chicken for a few hours. Thank you so much for creating and posting this recipe. Thank you for sharing Marry!! So glad you enjoyed it! I haven’t been to the farmers market yet but can’t wait 🙂 And love the tip on marinating for a while!